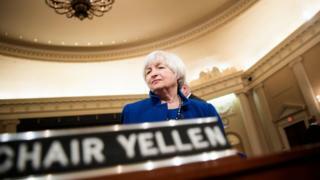 The US central bank said the move, which was widely expected, underscores "solid" gains in the US economy. US economic output has increased at an annual rate of more than 3% in recent quarters, while the unemployment rate fell to 4.1% last month - the lowest rate since 2001. "There's less to lose sleep about now than has been true for quite some time, so I feel good about the economic outlook," she said. Ms Yellen said policymakers expect the economy to get a further lift from a package of tax cuts - one of President Trump's central campaign promises - and those expectations were factored in when they revised upwards their predictions for economic growth. While Congress and President Trump's Administration continue to wrangle over tax reform, the Fed had to judge what the final outcome of that political process would mean for the economy. Inevitably there is a lot of uncertainty in there but they have concluded that it would provide a boost over the next three years. The Fed's policy makers expect somewhat stronger growth than they did in September. Janet Yellen said that reflected a view in the committee that the reforms would stimulate consumer spending and business investment. But there has not been much change in what the Fed's policy makers think of the longer term prospects. The Fed publishes information showing the range of expectations that its policy makers have. The middle of that range for long term growth is unchanged at a rather modest 1.8%. Despite the acceleration in growth, members of the Federal Open Markets Committee said they expect interest rate increases to remain gradual - in part, a sign of ongoing concerns that inflation has remained below the Fed's 2% target. But she said the Fed will continue to watch those numbers and "if necessary, re-think" what is determining them. "There's work undone there," she said.